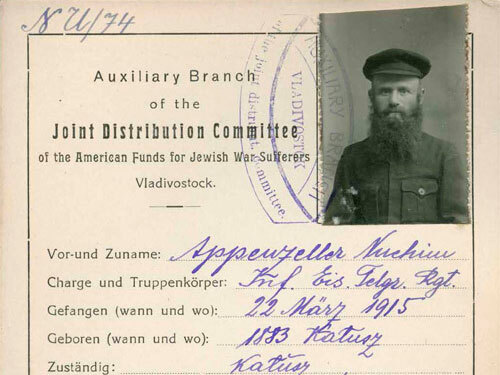 Rare records of Jewish German and Austro-Hungarian soldiers imprisoned in Siberia in 1920. 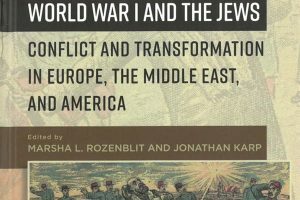 A collection of records of Jewish prisoners of war (henceforth PoWs) in Siberia from 1920 has been indexed and is now available online. The soldiers, depicted on the more than 1,000 cards that comprise the collection, served in the German and Austro-Hungarian armies. 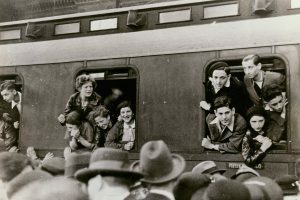 Consequentially these records, many of which contain biographical information and rare photographs, are an incredible historical resource for those who have German, Hungarian or Galitzianer heritage. In the wake of The Great War and the Russian Revolution, approximately 160,000 PoWs remained interned in camps in Siberia. The quality of life in these camps was abysmal, with many dying from disease, starvation and hypothermia. In 1919, the appalling conditions under which PoWs were living in Siberia were brought to the attention of the U.S. State Department. JDC’s representative turned to the Russian authorities to request permission to send relief to the camps of war prisoners. This relief, in the form of food, clothing, fuel, and money, was distributed on a non-sectarian basis. 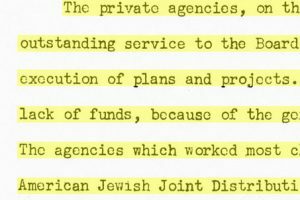 In addition, JDC’s office in Vladivostock conducted a survey of Jewish PoWs. The information was gathered on index cards which resulted in the formation of this important collection. 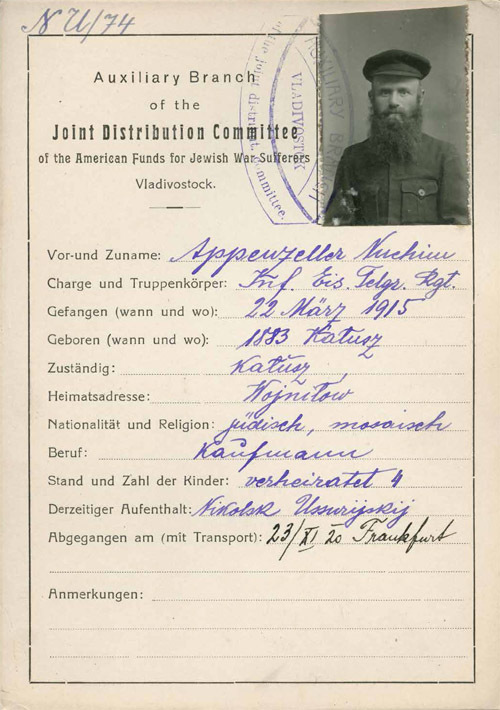 In 1920, JDC and the American Red Cross established the Siberian War Prisoners Repatriation Fund, which sought to repatriate all PoWs from Siberia to their homelands. Ships were chartered for this repatriation work which extended over one year. All PoWs who desired to return to their homes were able do so. This enterprise literally saved tens of thousands from death. The genealogical information on these cards (see above) includes: the name of the prisoner; where and when he was born, did his army service and was captured; home address; nationality; religion and occupation; photographs as well as other information. Search our Names Database to find World War I prisoner of war cards, as well as other records of JDC’s rescue and relief operations around the world. These records, as well as other rich documents that are of genealogical interest, have been made available through the efforts of a dedicated volunteer team.